(Nanowerk News) Most of the world’s electricity-producing power plants — whether powered by coal, natural gas, or nuclear fission — make electricity by generating steam that turns a turbine. That steam then is condensed back to water, and the cycle begins again. 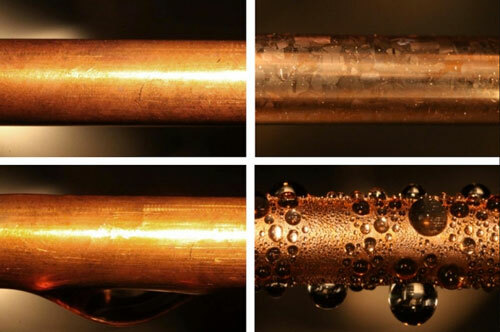 The findings are reported in the journal Nano Letters ("Scalable Graphene Coatings for Enhanced Condensation Heat Transfer") by MIT graduate student Daniel Preston, professors Evelyn Wang and Jing Kong, and two others. The improvement in condenser heat transfer, which is just one step in the power-production cycle, could lead to an overall improvement in power plant efficiency of 2 to 3 percent based on figures from the Electric Power Research Institute, Preston says — enough to make a significant dent in global carbon emissions, since such plants represent the vast majority of the world’s electricity generation. “That translates into millions of dollars per power plant per year,” he explains.